Washseparately in the washing machine on a gentle cycle without bleach. Don't worry if fluff appears, this is residue from the fiber produced when cutting the cotton. It's helpful to sweep the rug with a stiff broom in the direction of the plush for the first few days. After that,a vacuum cleaner should be used. The product has the ISO 9001, ISO 14001 and 18001 certificates. 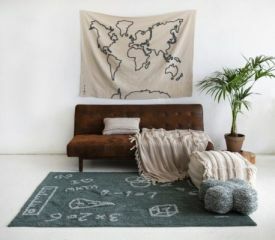 100% natural New Zealand lambswool, on a base of jute. They are handmaderugs, made using the Hand Tufting technique. Eco-friendly.Environmentally friendly product. 100% natural dyes and wool are used, so colors may vary. Soft texture.You will love its final appearance and consistency. 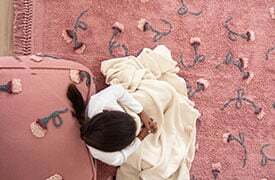 The wool is dyed In the manufacturing process, always using natural dyes, and subsequently the fibers are cut and woven, one-by-one, onto the base of the rug. Don't worry if fluff appears, this is residue from the fiber produced when cutting the wool. It's helpful to sweep the rug with a stiff broom in the direction of the plush for the first few days. After that a vacuum cleaner should be used. Avoid direct and continuous contact with the sun. For full cleaning of the rug we recommend using professional specialists. They are made with Soft-Acrylic, considered to be the highest quality acrylic. Its production system and material allow for the manufacture of designs with large dimensions. The product has the AITEX certificates. The same design is produced in three different sizes. Don't worry if fluff appears. To look after it correctly, frequent vacuuming is recommended. Do not allow the stain to dry. If it is solid and dry, rub and brush it. Apply cleaning product and gently rub. 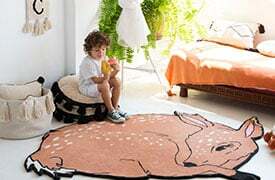 Ensure that the product used does not discolor the rug by testing it on a corner. Then apply warm water with a sponge and rub. It is important to thoroughly dry it. Gently brush the area that was stained.